Printmaking is the process of making artworks by printing, normally on paper. Printmaking normally covers only the process of creating prints with an element of originality, rather than just being a photographic reproduction of a painting. The process is capable of producing multiples of the same piece, which is called a 'print'. Works printed from a single plate create an edition, in modern times usually each signed and numbered to form a limited edition. For example number 5/50 means 5th piece from edition of 50. Each piece produced is not a copy but considered an original since it is not a reproduction of another work of art. If you are interested in printing technigue of your favorite artist, read through this article. It is good to know how the artwokr on your wll was created. 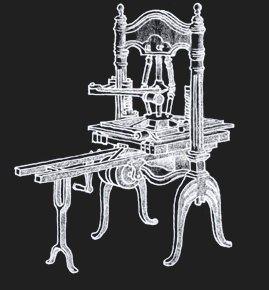 Printmaking techniques can be divided into the following basic families or categories: relief printing, intaglio and planographic. Relief printing where the ink goes on the original surface of the matrix is the oldest printmaking technique. Prinmaker transferes drawing on printing block, often wooden, then using various types of gravers removes material around the drawing. Ink lay on the raised places. We can simply liken this technique to imprint of a stamp. Relief techniques include: woodcut or woodblock, wood engraving, linocut and metalcut. Intaglio, where the ink goes beneath the original surface of the matrix allows the artist more fine work then other techniques. Printmaker engraves or etches image into metal plate - zinc, steel, copper or aluminium. Than the ink is rubed in engraved or etched places and by the pressure is the image pressed on paper. 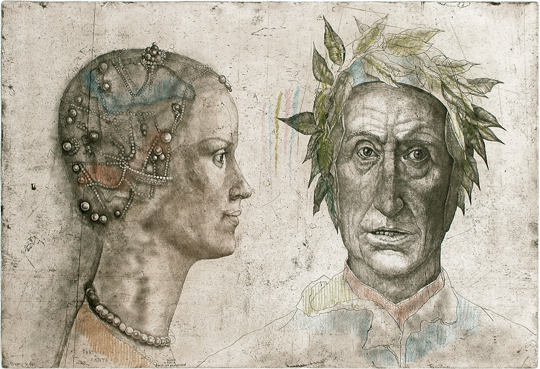 Intaglio techniques include: engraving, etching, mezzotint, aquatint, chine-collé and drypoint. Planographic technique, where the matrix retains its entire surface, but some parts are treated to make the image, is based on process when hydrophilic regions accepts a film of water and thereby repel the greasy ink and hydrophobic regions that repel water and accept ink. Planographic techniques include: lithography, monotyping, and digital techniques. Engraving is the oldest and moct complicated technique of intaglio printmaking, rarely used noawadays. Engravers use a hardened steel tool called a burin to cut the design into the surface of a metal plate, traditionally made of copper. Engraving using a burin is generally a difficult skill to learn. 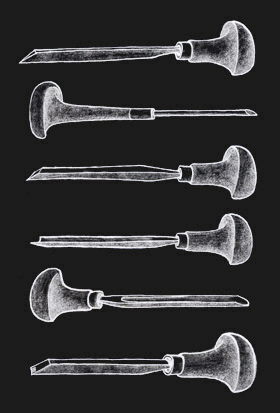 Gravers come in a variety of shapes and sizes that yield different line types. The burin produces a unique and recognizable quality of line that is characterized by its steady, deliberate appearance and clean edges. 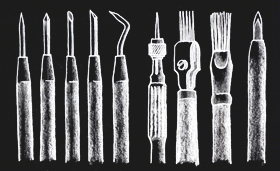 Other tools such as mezzotint rockers, roulets and burnishers are used for texturing effects. Etching came to challenge engraving as the most popular printmaking medium. Its great advantage was that, unlike engraving which requires special skill in metalworking, etching is relatively easy to learn for an artist trained in drawing. In pure etching, a metal (usually copper, zinc or steel) plate is covered with a waxy or acrylic ground. The artist then draws through the ground with a pointed etching needle. The exposed metal lines are then etched by dipping the plate in a bath of etchant (e.g. nitric acid or ferric chloride). The etchant "bites" into the exposed metal, leaving behind lines in the plate. The remaining ground is then cleaned off the plate, and the printing process is then just the same as for engraving. Drypoint is a variant of engraving, done with a sharp point, rather than a v-shaped burin. While engraved lines are very smooth and hard-edged, drypoint scratching leaves a rough burr at the edges of each line. This burr gives drypoint prints a characteristically soft, and sometimes blurry, line quality. Because the pressure of printing quickly destroys the burr, drypoint is useful only for very small editions; as few as ten or twenty impressions. To counter this, and allow for longer print runs, electro-plating has been used since the nineteenth century to harden the surface of a plate. The lines produced by printing a drypoint are actually formed by the burr thrown up at the edge of the incised lines, in addition to the depressions formed in the surface of the plate. A larger burr, formed by a steep angle of the tool, will hold a lot of ink, producing a characteristically soft, dense line that differentiates drypoint from other intaglio methods such as etching or engraving which produce a smooth, hard-edged line. 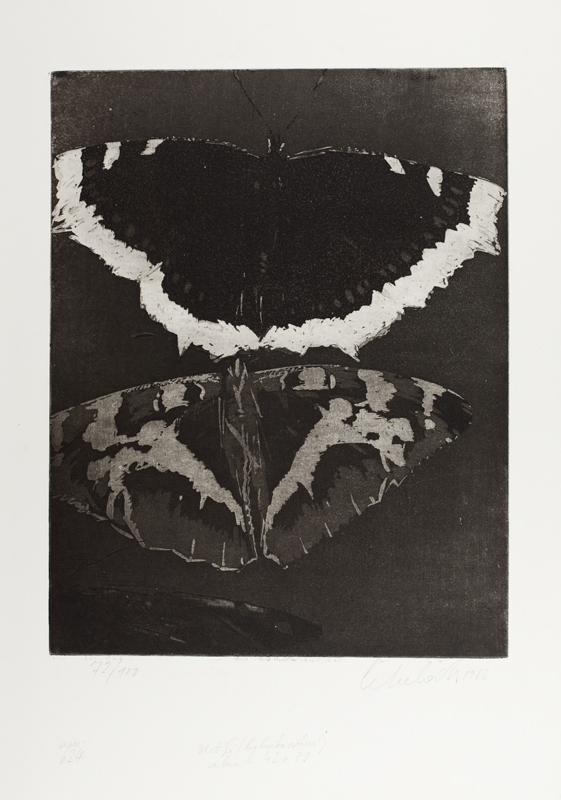 Printing is essentially the same as for the other intaglio techniques, but extra care is taken to preserve the burr. After the image is finished the artist applies ink to the plate with a dauber. Once the plate is completely covered with a thin layer, a tarlatan cloth is used to wipe away excess ink, and paper may be used for a final wipe of the lightest areas of the image. Some printmakers will use their bare hand instead to wipe these areas. Once the desired amount of ink is removed, the plate is run through an etching press along with a piece of dampened paper to produce a print. The name aquatint comes from Italian word acquatinta which means coloured water. Aquatint really reminds water-colour painting and invention of this technique was coused by the need to make print closer to water-colour and print continuous colour areas. Aquatint is still very popular among contemporary printmakers especially when combining various printing techniques. 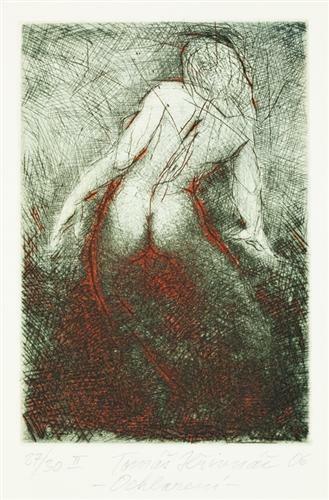 Like etching, aquatint technique involves the application of acid to make marks in a metal plate. Where the etching technique uses a needle to make lines that retain ink, aquatint relies on powdered rosin which is acid resistant in the ground to create a tonal effect. The rosin is applied in a light dusting by a fan booth, the rosin is then cooked until set on the plate. At this time the rosin can be burnished or scratched out to affect its tonal qualities. The tonal variation is controlled by the level of acid exposure over large areas, and thus the image is shaped by large sections at a time. 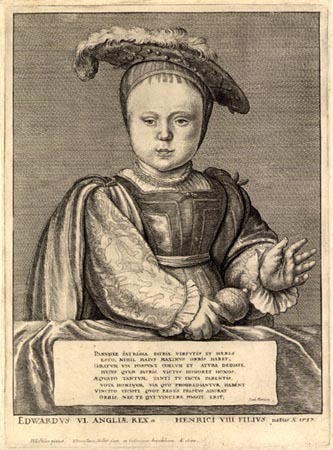 The mezzotint printmaking method was invented by the German amateur artist Ludwig von Siegen (1609–c 1680). It was the first tonal method to be used, enabling half-tones to be produced without using line- or dot-based techniques like hatching, cross-hatching or stipple. 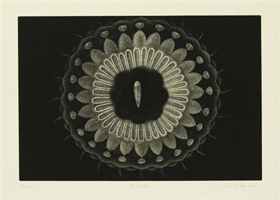 Mezzotint achieves tonality by roughening the plate with thousands of little dots made by a metal tool with small teeth, called a "rocker." In printing, the tiny pits in the plate hold the ink when the face of the plate is wiped clean. A high level of quality and richness in the print can be achieved. selectively burnishing areas of the surface of the metal plate with metal tools: the smoothed parts will print lighter than those areas not smoothed by the burnishing tool. Areas smoothed completely flat will not hold ink at all: such areas will print "white," that is, without ink. By varying the degree of smoothing, mid-tones between black and white can be created, hence the name mezzo-tinto which is Italian for "half-tone" or "half-painted". Because the pits in the plate are not deep, only a small number (40 - 60) of top-quality impressions can be printed before the quality of the tone starts to degrade as the pressure of the press begins to smooth them out. Woodcut, a type of relief print, is the earliest printmaking technique, and the only one traditionally used in the Far East. It was probably first developed as a means of printing patterns on cloth, and by the 5th century was used in China for printing text and images on paper. Woodcuts of images on paper developed around 1400 in Europe, and slightly later in Japan. These are the two areas where woodcut has been most extensively used purely as a process for making images without text. The artist draws a sketch either on a plank of wood, or on paper which is transferred to the wood. Traditionally the artist then handed the work to a specialist cutter, who then uses sharp tools to carve away the parts of the block that he/she does not want to receive the ink. The raised parts of the block are inked with a brayer, then a sheet of paper, perhaps slightly damp, is placed over the block. The block is then rubbed with a baren or spoon, or is run through a press. If in color, separate blocks can be used for each color, or a technique called reduction printing can be used. Since wood engraving is a relief process (ink is applied to the raised surface of the block) while metal engraving is an intaglio technique, wood engravings deteriorated much less quickly than copper-plate engravings and had a distinctive white-on-black character. Wood-engraved blocks could be used on conventional print presses, which were themselves making rapid mechanical improvements during the first quarter of the 19th century. Cut to be type-high, the blocks were composited within the page layout along with the movable type, and thousands of copies of such an illustrated page could be printed with almost not deterioration of the illustration blocks. As a result illustrations of art, nature, technical processes, famous people, foreign lands and many other subjects became more widely available. 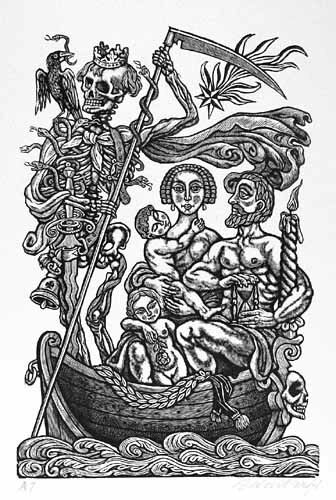 Linocut is a printmaking technique, a variant of woodcut in which a sheet of linoleum is used for the relief surface. A design is cut into the linoleum surface with a sharp knife, V-shaped chisel or gouge, with the raised (uncarved) areas representing a reversal (mirror image) of the parts to show printed. The linoleum sheet is inked with a roller, and then impressed onto paper or fabric. The actual printing can be done by hand or with a press. As the material being carved has no particular direction to its grain and does not tend to split, it is easier to obtain certain artistic effects with Lino than with most woods, although the resultant prints can lack the often angular grainy character of woodcuts and engravings. Lino is much easier to cut than wood; especially when heated, but the pressure of the printing process degrades the plate faster and it is difficult to create larger works due to the material's fragility. 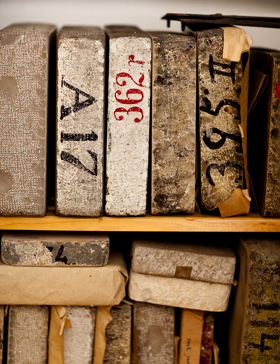 Lithography (from Greek lithos, 'stone' + graph?, 'to write') is a method for printing using a stone (lithographic limestone) with a completely smooth surface. Invented in 1796 by Alois Senefelder in Bohemia as a low-cost method of publishing theatrical works. Lithography uses simple chemical processes to create an image. For instance, the positive part of an image is a hydrophobic, or "water hating" substance, while the negative image would be hydrophilic or "water loving". Thus, when the plate is introduced to a compatible printing ink and water mixture, the ink will adhere to the positive image and the water will clean the negative image. This allows a flat print plate to be used, enabling much longer and more detailed print runs than the older physical methods of printing. 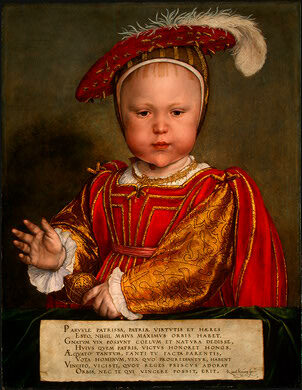 The image is drawn on the surface of the print plate with a fat or oil-based medium such as a wax crayon. Following the drawing of the image, an aqueous solution of gum arabic, weakly acidified with nitric acid is applied to the stone. The gum solution penetrates into the pores of the stone, completely surrounding the original image with a hydrophilic layer that will not accept the printing ink. When printing, the stone is kept wet with water. Printing ink loaded with pigment is then rolled over the surface. The water repels the greasy ink but the hydrophobic areas left by the original drawing material accept it. When the hydrophobic image is loaded with ink, the stone and paper are run through a press which applies even pressure over the surface, transferring the ink to the paper and off the stone. Lithographic stone could be very thick an heavy, for instance stone 80 by 120 cm weights more then 150 kilos. Colour lithography use multiple prints with a stone for each color and can not be reprinted.